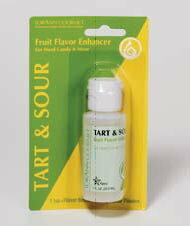 A unique flavor enhancer that adds zest to candies and bakes goods. Designed to be used with other flavors, allowing for countless flavoring possibilities. Tart & Sour peps up fruit pies and cakes. Combine with coarse sugar and use to top fruit muffins or scones. Other uses: Candy centers, taffies, marzipan. Add to jams, jellies & fruit toppings. Add to slushies or powdered fruit drinks for a unique sour taste.